I graduated from Northumbria University in 2016 and I've recently celebrated my 2-year anniversary at DWP Digital as an interaction designer. Studying interaction design at university gave me a really good base knowledge to build upon and during the past two years I have been able to develop a lot in my role. Last year the opportunity arose for me to go back to Northumbria University and set a live service design brief for the final year students who were in the same situation as I was two years previously. I was delighted to be able to go back to see what the current students were up to and to catch up with my lecturers. I know Northumbria University is always keen to shape their courses around ‘the real world’, as I can imagine many other educational institutions are. I believe it’s really important for organisations and companies to make the effort to connect with local schools, colleges and universities. Partnering with local companies and organisations is the best way to do this, so I was pleased to get involved. The 10-week brief involved the students working in groups of 2 to create their own government service. The brief stated that the service could be as realistic or as hypothetical as they wished as long as it could be researched with users and was driven by user needs. User research is a fundamental part of how we design in government and I really wanted this to drive the brief we set. 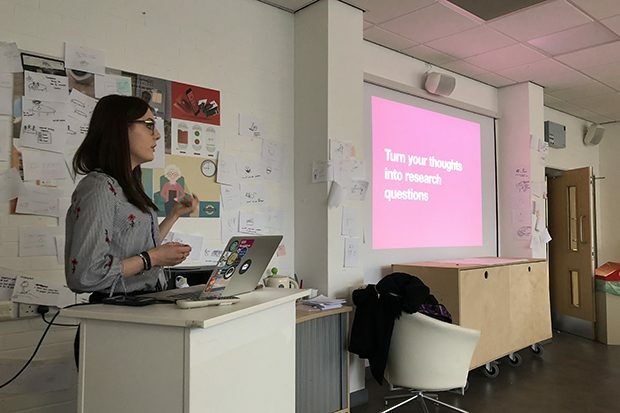 My former colleague Jessie Ferguson, now a user researcher at the Department for Education kindly offered up some of her time to run the brief with me and deliver an ‘introduction to user research’ workshop at the university. We visited the university at the end of each two-week sprint which enabled us to see how the students’ projects were progressing and to offer them advice and support. The students were exceptional at adapting to the government design approach and it was great to see them all learn so much as well as putting it into practice in such a short time frame. The students did a lot of work to study Government Digital Service (GDS) design principles as well as setting up and creating their own prototypes with the GDS prototyping kit. 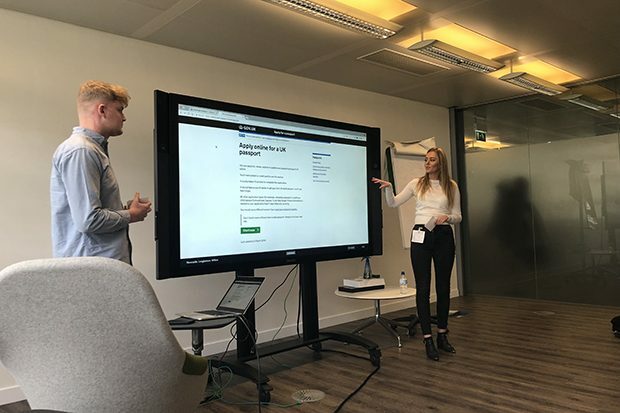 At the end of the 10 weeks, the students came to DWP’s Newcastle hub to present their projects to the product design community. It was brilliant to see how much they could learn in such a short period of time and to see all the different approaches, all with users at the heart. With projects ranging from a service for registering your pet, to an enhanced biometric passport, the work they produced was of an impressively high standard. Helping guide the service designers of tomorrow was a great experience. It’s really important for organisations and departments to keep supporting new talent, and I learned just as much as the students did during the process. And who knows, I could be working alongside some of them when they’ve graduated!